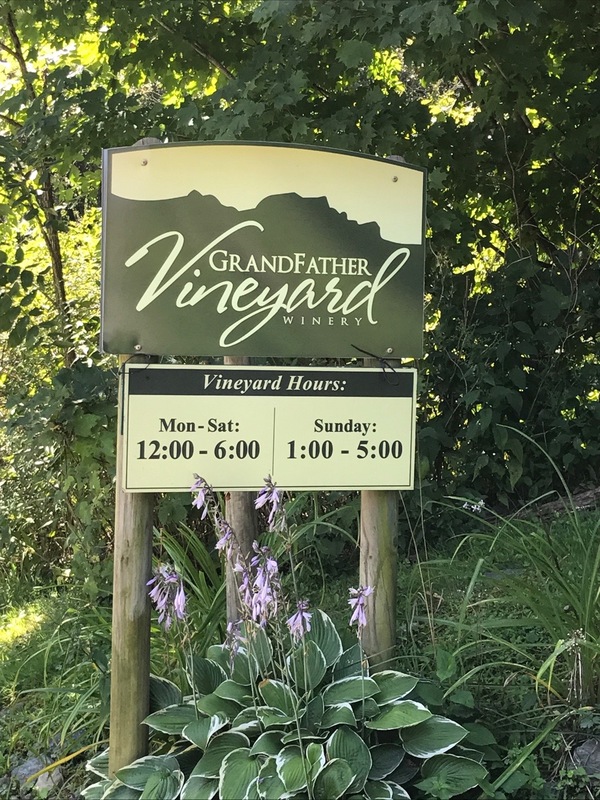 We recently had the opportunity to visit Grandfather Vineyard & Winery in Banner Elk, NC. It had been a year or more since we had last visited. It was good to taste again, take in the beautiful mountain scenery, and just relax! Grandfather is owned by Steve and Sally Tatum. The Tatums live on the property. They purchased the land where the winery and vineyard sit in 1998. The first planting of wine grapes happened in 2003. It should be noted that this was the first planting of wine grapes in the mountains of northwest North Carolina. The Tatums’ son, Dylan, is the winemaker. Dylan’s wife, Nicole, is the tasting room manager, so it’s a family run operation. Fruit is sourced from the vineyard onsite, other area vineyards within the Appalachian High Country AVA, the Yadkin Valley AVA, and Lodi in California. 2016 Pinot Gris – The nose was floral with a crisp minerality on the palate. 2016 Vidal Blanc – An Appalachian High Country wine, pear, apple, and melon showed on the nose. The palate was tart and crisp with light melon notes. 2016 Vermentino – These grapes were sourced from California. Lemon and cream greeted you on the nose. The palate was classic Vermentino. 2016 Viognier – A nose that was floral and peachy transitioned to a palate of grapefruit and lychee fruit. 2016 Chardonnay – The wine was barrel aged in French and American oak. A buttery nose continued on the palate with light oak. It finished crisp and had 1% residual sugar. 2016 Pinot Noir Rosé – Made from local and Willemette Valley, Oregon grapes, watermelon and strawberry showed on the nose and the palate. 2015 Cabernet Franc – This wine was made North Carolina grown grapes. Dark cherry, vanilla and bit of oak were the primary flavors. 2014 ASU Scholar – A Yadkin Valley wine made with the Fermentation Sciences students from Appalachian State University, this was a blend of Cabernet Sauvignon, Merlot, and Cabernet Franc. Cherry and oak predominated on this wine. We bought a bottle! Legacy Cabernet Sauvignon – Made from fruit from local fruit, Yadkin Valley fruit & Lodi, California fruit, the nose showed rich cherry and currants and was slightly floral. The palate had tart cherry, currants, and a light cedar note. 2015 Marechal Foch – Blackberry and blueberry notes greeted you on the nose of this Appalachian High Country AVA wine. The palate had a nice acidity with a bit of oak and spice. Legacy Zinfandel – This was a classic Lodi, California Zin – jammy and smokey. Tempranillo & Malbec – A blend of Tempranillo and Malbec from Lodi, California, this wine was a bit jammy with notes of cocoa, warm cherry, and vanilla. 2016 Seyval Blanc – A Watauga County wine from the Appalachian High Country AVA, this wine had notes of apple, sweet honeysuckle, and mango. 2016 Marquette – Served on draft, this Appalachian High Country AVA wine had notes of red currant, blackberry, and vanilla. You can purchase a growler of this wine. 2016 Merlot – Also served on draft and available for growlers, cherry predominated here. It was a very nice Merlot. Dylan was not available the day we visited, so Chris Denesha, one of the assistant winemakers, stepped in. Chris is originally from the Sonoma, California. He had stops in Spain and Southern Utah before coming to the High Country. Chris started the tour in the vineyard just outside the tasting room. He mentioned that Grandfather manages three other vineyards in the area and has 200 vines of Marquette planted just across the mountain from where we were standing. Current plantings in the vineyard onsite are Chardonnay, Catawba, Marechal Foch, Cabernet Franc, and Pinot Noir. Locust posts in this terraced vineyard came from trees that once stood where the vineyard was planted. After the vineyard, we made stops in the barrel room and the winery. The barrel room has French, American, and Hungarian oak barrels. Some are new. Others have one or two years of use. The winery is small. It sits just behind the tasting room. Fermentation Sciences students from Appalachian State University in Boone often work with the Grandfather staff on wines and ciders. We wrapped us the tour and headed back into the tasting room to purchase wines and say goodbye to Nicole. The next time you’re the High Country, be sure to stop by and check out Grandfather Vineyard & Winery. Grab a bottle and relax by the gently following Watauga River. Tell them we sent you!